To assist research into optimal procedures for welding aero engine fan blades, nuclear pressure vessels and other safety-critical fabrications, a new material testing capability has been developed at the Open University in Milton Keynes, UK. The digital image correlation-based technique uses digital images to measure spatially resolved deformation of test samples at elevated temperatures under vacuum. This method allows material property data of rapidly oxidising materials to be obtained at temperatures up to 900°C. The data can then be used to predict in-service deformation behaviour. The work is being carried out by Dr Alexander Forsey, a research associate at the University’s Department of Engineering and Innovation. The test equipment comprises a Zwick Roell slow strain rate universal testing machine combined with a Severn Thermal Solutions vacuum furnace. A flat sample is extracted from the weld section under investigation by wire spark erosion, with the weld extending along the width of the gauge length. This produces a crossweld sample with parent material at either end and the weldment and heat affected zone (HAZ) in the centre and in the field of view. The photographic equipment chosen was a Nikon Nikkor 200 mm f/4 IF-ED micro lens connected via a bellows to a DS-Qi2 low-noise, monochrome microscopy digital camera that transmits test data in real time to a laptop via a USB3 cable. The camera and software was supplied by Nikon Metrology, (www.nikonmetrology.com/en_EU), whose UK headquarters are in Derby. Dr Forsey pointed out that the solution was one-quarter of the price of a dedicated scientific camera with on-board random access memory for storing data. The Nikon camera, which is normally fitted to microscopes for capturing digital microscopic images, contains the same full-frame, 16.25 megapixel CMOS sensor as the Japanese manufacturer’s D4 digital single lens reflex (DSLR) camera, but with the colour filter array removed. Regions as small as 9 x 9 pixels can be tracked to sub-pixel resolution to measure the displacement of a random speckle pattern on the surface of the test sample. Under ideal conditions, accuracy down to 1/300th of a pixel is attainable, but this is only achievable at the expense of spatial resolution. The DS-Qi2 can run at up to 45 frames per second (fps). However, at the Open University the speed is normally restricted in order to capture full resolution images and to allow the hard drive in the laptop to keep up with the data flow. During a typical 40-minute test period, between 2,000 and 3,000 raw photomicrographs are taken at around 1 fps, each approximately 31 MB in size. Nikon NIS Elements BR software is used for time lapse control of the camera from the laptop. One ongoing test programme is in conjunction with partners in the aerospace industry to better understand engine component life. The work is to measure the high temperature tensile properties of a titanium alloy (Ti64) weld. 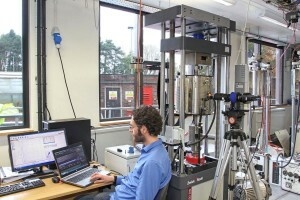 The results of these tests are used as input data for computer modeling, which can enable weight to be saved on individual parts to produce more fuel-efficient engines. Dr Forsey measures high temperature stress-strain profiles for the different sections of the weld, HAZ and parent material using the images taken by the Nikon Metrology DS-Qi2 camera. He said that it is possible to measure not only engineering strain using the research apparatus at the university, but also to closely approximate true strain because the reduction in cross sectional area can be estimated using the equipment. A large part of the work carried out by the Open University research laboratory concerns testing the welds of nuclear power pressure vessels, which often involve dissimilar metal welds. The tensile and creep properties of TIG (tungsten inert gas), multi-pass weld interfaces of both pre-and post-service vessels, which can be up to 200 mm thick, are sampled and tested in the vacuum furnace. The material is not radioactive, as it has been taken from vessels storing pressurised water or carbon dioxide. When visited, Dr Forsey was analysing a weld sample from a stainless steel vessel owned by EDF Energy. The parent materials on either side of the weld were 316H stainless steel and Esshete respectively, while the filler was 316L stainless steel. Again, the test involved short-term analysis of the stress-strain map across the weld. Creep analysis of weld joints is another area of expertise for the laboratory, involving long-term examination at high temperature on similar strain testing equipment, but over a period of six months or more. For these applications, which require time lapse photography at much longer intervals, standard Nikon D810 colour DSLRs are used in conjunction with bellows and Nikon Nikkor 200 mm f/4 IF-ED micro lenses to record the data. 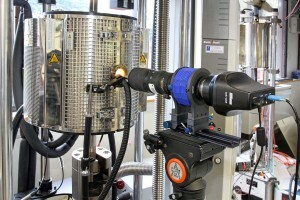 Most recently, Dr Forsey has equipped one of the creep test rigs with a bespoke furnace that enables two Nikon cameras to record weld creep deformation in 3D.